Does it provide dynamic animation background for the flipping book? 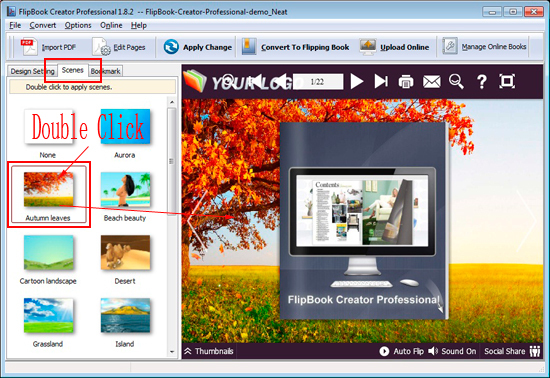 FlipBook Creator (Professional) supports dynamic background. There are plenty of animated backgrounds built in free for you. The innovative and creative flipping idea plus dynamic backgrounds help build really outstanding publications. Once you begin to use the animated background, your flipping books become more and more popular. You know, people tend to like those cool and different elements. Wish dynamic background make sense. Step1: If you just use the old version, please download the newest version. Step2: Click the tab of Scenes. Step3: In the following scenes, you can choose your favorite one, double click to apply.